This election was characterized as a popularity contest between the experienced, liberal Gore and the "compassionate conservative" Bush. The race touched on gun control, abortion rights, education, welfare, Social Security, and the legacies - good and bad - of the Clinton administration. Gore won the popular vote but the electoral victory depended on contested Florida ballots. It was the first time a presidential election was contested in the courts. The nation came close to a constitutional crisis. The Supreme Court halted a recount. The election went to Bush 36 days after the votes were cast. 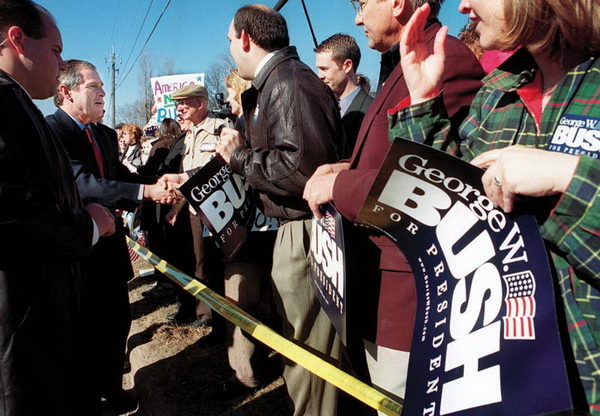 George W. Bush greets a crowd during a campaign stop in Eau Claire, May 24, 2000. Photo by Craig Schreiner, courtesy of the "Wisconsin State Journal." 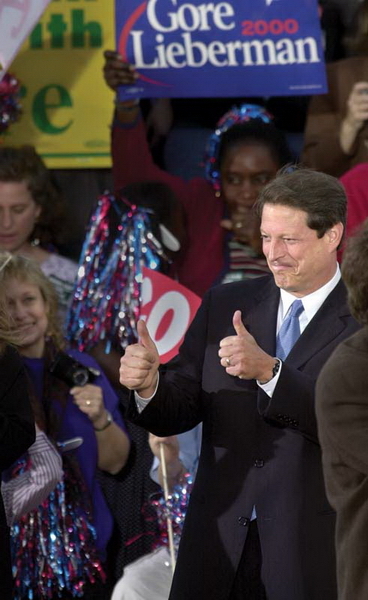 Al Gore campaigns in Madison, October 26, 2000. Photo by Sarah B. Tews, courtesy of the "Wisconsin State Journal."